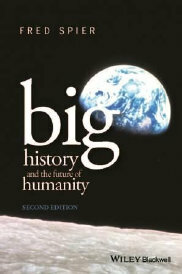 This website provides a wide range of information about Fred Spier’s book Big History and the Future of Humanity, Second Edition, Wiley Blackwell, released in the spring of 2015, in particular for using it as a textbook for teaching big history at college level. Also e-book versions are available on Wiley.com and elsewhere, including Kindle and Apple iBook versions. In doing so, this website also provides important general information about big history, including links to major websites that may be helpful to become familiar with big history. Furthermore, the Author's blog offers a growing number of big history reflections and research by the author based on the approach explained in Big History and the Future of Humanity, Second Edition. Featuring updates and new discussions about salient topics in big history, the Second Edition presents an accessible and original overview of the entire sweep of history from the origin of the universe up to the present day. While providing this overview, the book offers a simple original model that explains major underlying principles of big history, including human history. This model has not been challenged so far, and is increasingly adopted by other scholars, most notably in the Big History Project sponsored by Microsoft cofounder Bill Gates and related productions. The widely-acclaimed first edition has already been used for teaching big history at universities in the United States, Europe, Africa, and Australia. The book has also proven to be very popular in unusual settings, including teaching big history to adventurous cyclists biking all the way from Istanbul to Beijing along the ancient Silk Road as well as to inmates in a US high security prison. So the possibilities seem limitless. The Second Edition has been adapted to be even more suitable for teaching big history. But because most teaching features will appear on this web site and not in the book, it can also be read very well separately without any teaching purposes. For information about the book not provided on this website, or to request an examination copy, please visit Wiley.com. To purchase this book, please visit Wiley.com or your favorite retailers. cookies on your device or track it in any other ways. No advertisements or other third-party Internet-based materials will appear on this website either.